Pharnavaz (Georgian: ფარნავაზი Georgian pronunciation: [pʰɑrnɑvɑzi]) also transliterated as Parnavaz or Farnavaziv[›] was the king of Kartli, an ancient Georgian kingdom known as Iberia to the Classical sources. The Georgian Chronicles credits him with being the first monarch founding the kingship of Kartli and the Pharnavazid dynasty, while another independent chronicles, The Conversion of Kartli makes him the second Georgian monarch. Based on the medieval evidence, most scholars locate Pharnavaz’s rule in the 3rd century BC: 302–237 BC according to Prince Vakhushti of Kartli, 299–234 BC according to Cyril Toumanoff and 284–219 BC according to Pavle Ingoroqva. Pharnavaz's rise and the advent of the Iberian monarchy was directly tied to the victory of Alexander the Great over the Achaemenid Empire. According to the Georgian royal annals, Pharnavaz descended from Uplos, son of Mtskhetos, son of Kartlos, who was one of the powerful and famous eight brothers, who from their part were descendants of Targamos, son of Tarsi, the grandson of Japheth, son of the Biblical Noah. He is not directly attested in non-Georgian sources and there is no definite contemporary indication that he was indeed the first of the Georgian kings. His story is saturated with legendary imagery and symbols, and it seems feasible that, as the memory of the historical facts faded, the real Pharnavaz "accumulated a legendary façade" and emerged as the model pre-Christian monarch in the Georgian annals. According to the c. 800 chronicle The Life of Kings, Pharnavaz had a distinguished genealogy, tracing back to Kartlos, the mythical ethnarch of Kartli. His paternal uncle, Samara, held the position of mamasakhlisi ("father of the house") of the Georgian tribes around Mtskheta. Pharnavaz’s mother is claimed to have been a Persian woman from Isfahan, whom Prince Teimuraz of Georgia and Patriarch Anton I of Georgia identify with a daughter of King Darius III. The entire story of Pharnavaz, although written by a Christian chronicler, abounds in ancient Iranian-like imagery and mystic allusions, a reflection of the archaeologically confirmed cultural and presumably political ties between Iran and Kartli of that time. The name "Pharnavaz" is also an illustrative example with its root par- being based upon the Persian farnah, the divine radiance believed by the ancient Iranians to mark a legitimate dynast (cf. khvarenah). The dynastic tag Parnavaziani ("of/from/named for Pharnavaz") is also preserved in the early Armenian histories as P'arnawazean (Faustus of Byzantium 5.15; fifth century) and P'arazean (History of Armenia 14; probably the early fifth century), an acknowledgment that a king named Pharnavaz was understood to have been the founder of a Georgian dynasty. Pharnavaz is also mentioned in the Armazi stele of Serapit. Perhaps the most artistically rounded section of the Georgian annals, the narrative follows Pharnavaz's life from birth to burial. Aged 3, small Pharnavaz's family is destroyed, and his heritage is usurped by Azon installed by Alexander the Great during his campaign in Kartli. Alexander's invasion of Iberia, remembered not only by the Georgian historical tradition, but also by Pliny the Elder (4.10.39) and Gaius Julius Solinus (9.19), appears to be memory of some Macedonian interference in Iberia, which must have taken place in connection with the expedition mentioned by Strabo (11.14.9) sent by Alexander in 323 BC to the confines of Iberia, in search of gold mines. Pharnavaz is brought up fatherless, but a magic dream, in which he anoints himself with the essence of the Sun, heralds the peripeteia. He is persuaded by this vision to "devote [himself] to noble deeds". He then sets off and goes hunting. In a pursuit of a deer, he encounters a mass of treasure stored in a hidden cave. Pharnavaz retrieves the treasure and exploits it to mount a loyal army against the tyrannical Azon. He is aided by Kuji of Colchis, who eventually marries Pharnavaz's sister. The rebels are also joined by 1,000 soldiers from Azon's camp; they are anachronistically referred to by the author as Romans, and claimed to have been entitled by the victorious Pharnavaz as aznauri (i.e., nobles) after Azon (this etymology is false, however). The main threads of Pharnavaz's story - a fatherless boy hidden and raised in a remote mountains, a forgotten lineage, his dreams, sacral kingship, solar imagery, the hunt, discovery of cave-concealed treasure etc. are reminiscent of legends about Iran's founding kings, like Cyrus the Great and Ardashir I. Pharnavaz's self-anointment may have a Sasanian inspiration, as some early Shahanshahs crowned themselves. In the ensuing battle, Azon is defeated and killed, and Pharnavaz becomes the king of Kartli at the age of 27. He is reported to have acknowledged the suzerainty of the Seleucids, the Hellenistic successors of Alexander in the Middle East, who are afforded by the Georgian chronicles the generic name of Antiochus. “ ფარნავაზ წარავლინნა მოციქულნი წინაშე მეფისა ანტიოქოს ასურასტანისა, და წარსცა ძღუენი დიდ-ძალი. და აღუთქუა მას მსახურება, და ითხოვა მისგან შეწევნა ბერძენთა ზედა. ხოლო ანტიოქოს შეიწყნარა ძღუენი მისი, და უწოდა შვილად თჳსად, და წარმოსცა გჳრგჳნი. Pharnavaz is also said to have patterned his administration upon an "Iranian" model. “ ესრეთ განაწესა ესე ყოველი ფარნავაზ მიმსგავსებულად სამეფოსა სპარსთასა. Pharnavaz had introduced a military-administrative organization based on a network of regional governors or eristavi. The insignia of the eristavi, received from the king, constituted a sceptre, a special signet ring, belt and armament. Iberia had in total seven eristavis, in Colchis, Kakheti, Khunani (modern-day northern Azerbaijan), Samshvilde (Kvemo Kartli), Tsunda (included Javakheti, Kola and Artaani), Odzrkhe and Klarjeti. The kingdom had one spaspet who was under the direct control of the royal power based in Inner Kartli. Eristavates mimicked aspects of Achaemenid satrapies and Seleucid strategoi. The major motive of later historian of the chronicles was to convince posterity that the basic political structure of Kartli was created by the very first Georgian monarch in the wake of Wars of Alexander the Great; was of Achaemenid administrative system and had remained stable throughout Hellenistic, Parthian and Sasanian times. In this way, the long-term viability and stability of the Georgian realm are established. The hierarchic structure created by Pharnavaz was the following: king; commander-in-chief (spaspet) of the royal army; eristavis; middle commanders (atasistavis tsikhistavis) of the garrisons stationed in the royal strongholds; junior commanders (asistavis) who were the younger sons of the aristocratic families; mercenary professional warriors from the neighboring countries and all the soldiers organized around the entire kingdom. It is evident that the division of Iberia by Pharnavaz into saeristavos served first and foremost a military aim, namely the organization of people for the purpose of defence. This organization was not so much directed against other countries. Back then the total population of the kingdom would have been, including foreign captives and the population of the tributary areas, about 600,000, which could raise a fairly big army not less than 100,000. According to Strabo the Iberian army numbered 70-80,000 so it appears that each saeristavo had 10,000 soldiers. While Georgian and Classical evidence makes the contemporaneous Kartlian links with the Seleucids plausible (Toumanoff has even implied that the kings of Kartli might have aided the Seleucids in holding the resurgent Orontids of Armenia in check), Pharnavaz's alleged reform of the eristavi fiefdoms is most likely a back-projection of the medieval pattern of subdivision to the remote past. Pharnavaz is then reported to have embarked on social and cultural projects; he supervised two building projects: the raising of the idol Armazi – reputedly named after him – on a mountain ledge and the construction of a similarly named fortress. Pharnavaz made alliances with various North Caucasian peoples during his reign, to whom he called upon for help against both Macedonia and internal foes. He took a Durdzuk woman in marriage, in order to consolidate the alliance of Iberia with the Durdzuks, who helped him consolidate his reign against his unruly vassals. Similarly he married his sister to a Sarmatian chief. “ და ესე ფარნავაზ იყო პირველი მეფე ქართლსა შინა ქართლოსისა ნათესავთაგანი. ამან განავრცო ენა ქართული, და არ-ღა-რა იზრახებოდა სხუა ენა ქართლსა შინა თჳნიერ ქართულისა. და ამან შექმნა მწიგნობრობა ქართული. და მოკუდა ფარნავაზ, და დაფლეს წინაშე არმაზისა კერპისა. The chronicles report Pharnavaz's lengthy reign of 65 years. “ ამან ფარნავაზ მოზღუდა ქალაქი მცხეთა მტკიცედ, და ყოველნი ქალაქნი და ციხენი ქართლისანი, მოოჴრებულნი ალექსანდრესგან, ამან აღაშენნა. და ვერ-ღა-რა იძიეს შური ბერძენთა მის ზედა, რამეთუ უცალო იყვნეს ბერძენნი ბრძოლისაგან ჰრომთასა. Upon his death, he was buried in front of the idol Armazi and worshipped. His son Saurmag succeeded him to the throne. Pharnavaz's grave is undisclosed so far. One of the last monarchs who visited his grave to adorn it and pay his respects was King Mirian III. Pharnavaz's very burial in front of idol Armazi suggests a Hellenistic deification of the early monarchs of Iberia. Several modern scholars have been tempted to make identification between the Pharnavaz of the medieval Georgian tradition and the Pharasmanes of the Greco-Roman historian Arrian, a 2nd-century AD author of The Anabasis of Alexander. Arrian recounts that "Pharasmanes (Фαρασμάνης), king of the Chorasmians", visited Alexander the Great with 1500 horseman, and pledged his support should Alexander desire to campaign to the Euxine lands and subdue Colchians, whom Pharasmanes names as his neighbors. Apart from the similarity of the names of Pharasmanes and Pharnavaz (both names are apparently based on the same root, the Iranian farnah), it is interesting to note that the king of Chorasmia in Central Asia reports Colchis (today’s western Georgia, i.e., the western neighbor of ancient Kartli/Iberia) to be a neighboring country. Some Georgian scholars have suggested that the Greek copyists of Arrian might have confused Chorasmia with Cholarzene (Chorzene), a Classical rendering of the southwest Georgian marchlands (the medieval Tao-Klarjeti), which indeed bordered with Colchis and Pontus. King Pharnavaz's street in Batumi. The Bagrationi dynasty claimed descent directly from Pharnavaz. 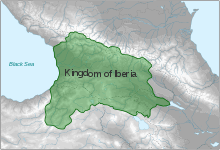 During the continuity of monarchy in Georgia, the Georgian kings presented themselves as heirs to the Kingdom of Iberia founded by King Pharnavaz. In Tbilisi there is a King Pharnavaz Street, Avenue, and also a statue of Pharnavaz. Also, there are streets named after Pharnavaz in Batumi, Kutaisi, Khashuri, Gori, Gurjaani, Sachkhere, Zestaponi and others. Some buildings, including schools and hotels, also bear his name, as well as about five hundred Georgians. ^ v: This account is now considered legendary, and is rejected by scholarly consensus, as no archaeological confirmation has been found so far. An alternate interpretation of this tradition is the pre-Christian use of foreign scripts (alloglottography in Aramaic alphabet) to write down Georgian texts. The existence of a peculiar local form of Aramaic in pre-Christian Georgia has been archaeologically documented. 1 2 3 4 5 Rapp, p. 276. 1 2 Rapp, p. 277. 1 2 Rapp, p. 280. Rapp, Stephen H. (2003) Studies In Medieval Georgian Historiography: Early Texts And Eurasian Contexts. Peeters Bvba ISBN 90-429-1318-5. Georgian royal annals, Life of Pharnavaz: The first Georgian king of Kartli, Part IV. TITUS (Online Version). Rayfield, Donald (2000) The Literature of Georgia: A History. Routledge, ISBN 0-7007-1163-5. Suny, Ronald Grigor (1994) The Making of the Georgian Nation (2nd edition). Indiana University Press, ISBN 0-253-20915-3. Toumanoff, Cyril (1963) Studies in Christian Caucasian History. Georgetown University Press. Gamkrelidze, Gela (2012) Researches in Iberia-Colchology, David Braund ed. Yarshater, Ehsan (1983) The Cambridge History of Iran. Cambridge University Press, ISBN 0-521-24693-8. Lordkipanidze, Otar (1983) "La Géorgie à l'époque hellénistique", dans Dialogues d'histoire ancienne, vol. 9, pp. 197–216.